Very soon web and TV news will be flooded with suggestions on how to cope with heat waves which will inevitably strike Italy in the summer months. Such heat waves deal a hard blow not only to citizens’ health but also to their pockets: cooling our apartments could cost approximately 0,14 EUR per hour – that’s about 50 EUR per month – for multi-split air conditioner based on the average cost of a kWh in May 2016. But the same weather affects could cause different conditions in different places. Urban areas are usually warmer than their rural surroundings, a phenomenon known as the heat island effect. According to EPA (US Environmental Protection Agency) “the annual mean air temperature of a city with 1 million people or more can be 1–3°C warmer than its surroundings. In the evening, the difference can be as high as 12°C”. The maps illustrate our analysis of the heat island effect for the city of Rome, using day-time and night-time Land Surface Temperature (LST) data obtained by the Moderate Resolution Imaging Spectroradiometer (MODIS). The maps show the difference in temperature between urban and rural areas, where we have taken the area inside the “GRA – Grande Raccordo Anulare” (the ring-shaped highway around Rome) as the urban area of interest and the southern countryside outside the GRA crossed by the Ardeatina road as the rural area of reference. Google Earth Engine was used to access and process 16 years of data (1520 images), from 2000 to 2016. 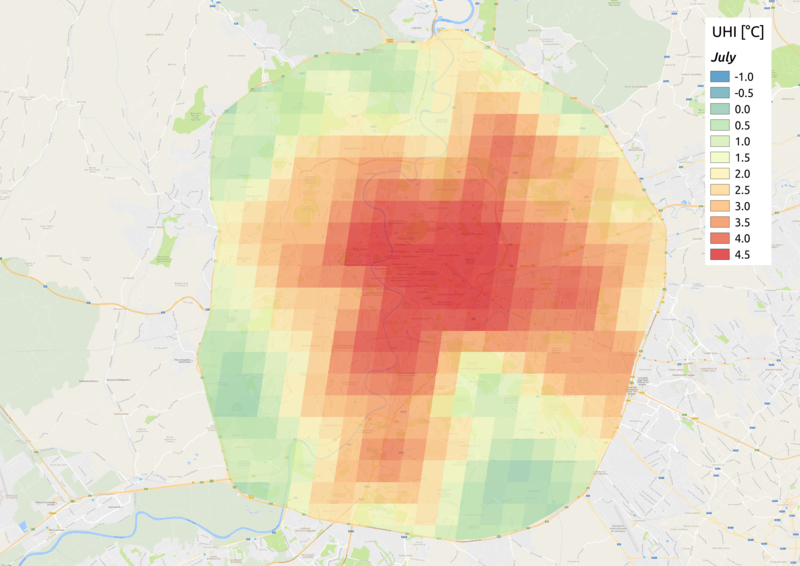 Our Urban Heat Island (UHI) maps show a negative or almost zero UHI intensity during the day, while during the night, as expected, the UHI is particularly significant. Also, the UHI effect is relevant both during the summer and during the winter. The “centre” of the phenomenon is in the centre of the city, but interesting monthly patterns appear, as the big x-shape UHI during the summer season; a rough explaination is that this is correlated with the actual pattern of the built areas. A hot summer looms ahead for the approximately 2.8M residents and the very large number of commuters which will stay in the city. However, every cloud has a silver lining, or, to quote a Russian proverb, a stick has two ends. In the winter, Roman households in the “x-shaped” area will spend less to warm up their apartments…. A high resolution map of the nocturnal UHI effect in Rome in July is available here (warning: 4 MB image). – The MYD11A2 products were retrieved from Google Earth Engine, courtesy of the NASA EOSDIS Land Processes Distributed Active Archive Center (LP DAAC), USGS/Earth Resources Observation and Science (EROS) Center, Sioux Falls, South Dakota, https://earthengine.google.com.